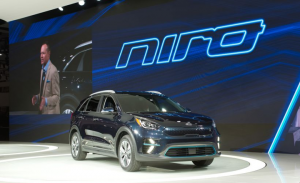 Kia unveiled its 2019 Niro EV and the 2020 Soul, which is coming in a gasoline and electric version, at the LA Auto Show. The 2019 Kia Niro EV will be coming to market with a 64-killowatt-per-hour lithium-ion polymer battery that will support DC fast-charging as standard equipment. Final range on the vehicle is still being finalized, but the company noted an estimate above 200 miles during its press conference. The 2019 Niro EV will offer four driving modes — eco, normal, sport, and eco+ — that will automatically adjust vehicle settings such as heating, air conditioning, speed limits, and regenerative braking to manage fuel efficiency. Drivers can also adjust regenerative braking levels using paddle shifters to add extra range. The 2020 model year will mark a new vehicle generation for the Kia Soul. The upcoming model of the vehicle will come with a redesigned exterior and new platform.